Here’s a true gem. My 29er SS built by Hugh Black from True North Cycles. Steel frame, carbon Pace fork, DT Swiss hubs on Salsa Cross rims…. 19lbs and climbs like a FREAK! TN Cycles is small shop located in Kitchener that builts bar none the best Steel 29ers in the business. Hugh is a true craftsman as well as passionate cyclist and it shows in all his bikes. I’ve talked to a few more people concerning the new WTB tires due out in ’08 and there’s lots of good news. The tire I posted about yesterday is actually the Prowler SL and is one of three tires targeted to the race scene. They are also releasing the Stout tire in a 29er version which is one from their All Mountain line. 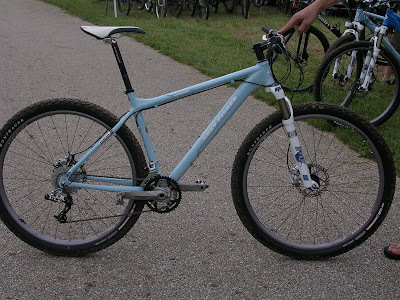 I’ve also been told from a semi-reliable source that the Vulpine will be released in a 29er however when I asked my WTB source about this I couldn’t get a confirmation. Initially there was also a big, burly 2.5 inch tire in the works but has since been pushed back to ’09. I wasn’t clear if it was due to R&D problems or waiting to see if the freeride/downhill 29er market grows. In an earlier post I detailed my first impressions of the new Fox F-29 fork. This fork has the new 51mm offset that was developed for the Fisher G2 29″er geometry. In light of this, the Fox fork really becomes essential to the geometry package and in a way it can be looked at as a proprietary component to the frame. It’s an interesting move on the part of both Gary Fisher and Fox. Is it worth it? Does it work? That’s the big question on a lot of folks minds these days. Not only do you have the new geometry, but you have an entirely redesigned from the ground up frame in the new 2008 Paragon. A lot is going on here, so let’s start taking a look see! 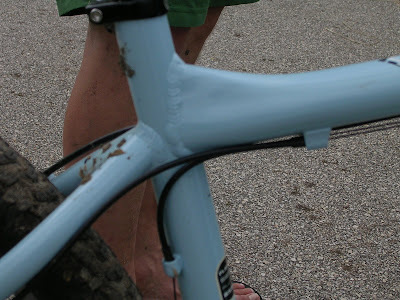 The initial impression I had was ,”Is that a Ferrous with a white saddle?” The baby blue color and subdued graphics were familiar, but upon closer inspection it was apparent this was an entirely new bike. Highlighting the bike is the Fox fork, of course, but also the frame is striking with it’s hydro formed top and down tubes lending the bike a softer, more organic look. It’s not just about looks though, as this frame was designed to address several short comings of the previous generation of Paragon 29″ers. The frame has a new top tube/seat tube junction designed to eliminate the issues Fisher hardtails seemed to have with breakage at this point in the previous generation of hardtails. The hydroforming giving the tube a built in “gusset” if you will. The reinforcements and hydro forming don’t stop there though. Fisher added a new down tube/steertube/top tube design to give more strength to shorter 29″er headtubes and have plenty of “Reba clearance” for fork knobs to pass under the down tube in crashes. Even the chainstays got the hydro formed treatment with an assymetrical design and huge tire clearance for up to 2.5″ rubber. G2 is Fisher speak for an update of the original Genesis geometry. It includes a longer offset to the fork to give a bit of a boost in the steering quickness at slow speed, yet retain a stable downhill stance at higher speeds. Corners are said to be easier to carve without over correction. Does it work? Well, in my extended trail test ride I can say two things really stuck out for me right away with this geometry package. First was that I indeed did see an improvement in slow speed handling. I could manage little directional changes during climbing without sawing away wildly at the bars to over correct for my choice of line. I also noticed that picking my way through some gnarlier sections was a bit calmer ordeal than with some other bikes. The second thing was that this bike steers with very little input from the rider, showing me that it does have a quicker steering nature than some other geometries for 29″ers. This is what I love about the bike. It’s not everyones cup of tea, and some will complain about it being “twitchy” perhaps, but not I. In fact on higher speed, rock strewn downhills, I felt the bike was rather well composed for a hardtail. Line changes were a snap at speed. the front was easy to loft, and the climbing traction was rather good. I was able to weight/unweight the rear wheel as I wanted with ease. The fork was perhaps a bit stiffer than a Reba, but as I said in the fork impression, I really wasn’t able to explore any other settings during my time with it. This may have helped make the bike feel even more stable and plush had I had the time and knowledge to bring to bear on this fork. The bottom bracket is really solid. I couldn’t see much movement down there as I mashed a climb single speed style in a bigger gear. The ride quality of the rear of the bike was pleasant for an aluminum frame. Still not in the league of a fine steel bike, nor anywhere near a Mamasita or Cannondale F-29, but not at all harsh. Definitely solid feeling. I give this bike a big thumbs up for the redesign. The G2 geometry? The jury is still out, but it appears to have merit and seems to be doing some of the things it claims. At least in the short time I had with it. The spec is outstanding with the addition of Rhythm Tubeless Ready wheels, hydraulic brakes, and the Fox fork most notable over last years bike. (Umm…..that’s this years bike and next years is better, or something like that…..) The graphics are a step in the direction of what we have seen with other Fisher products- less and subtle. The “computerized” graphics of the ’07’s have thankfully been left behind. The blue color and white fork are a bit polarizing. I like it, but it does remind me of mid eighties 20 inchers for some reason! Keep an eye here on Twenty Nine Inches for any more news on Fishers ’08 29″er line up! For 2008, WTB will be releasing four new 29er tires. We caught some pictures of the first set that were mounted on a Niner. They are 2.1 and named “Prowlers”. There was no print on the tires other than the WTB logo and we were told there are only three sets in existence. I’ve got more info on the other three sets coming down the pipeline… I’ll do an update at that time. Those are both quotes from industry folks that were there. The sponsors made the event possible. Buy their stuff. It’s good stuff. This is Steve from Niner realizing his minuscule 29 inch wheels are already obsolete next to the 36er. Who the hell said cyclists are all skinny? Here’s Bobby from Salsa again. His new nickname is Shrek. I can’t imagine why. Pimpin’ (in tights) ain’t easy and nobody does it like Brent from Twin Six. When I try to wheelie a 26er I usually hurt myself. This was a long wheelie on +10 inches. Sure, it was a big wheel event, but who can resist a limited edition pink Surly 1×1? The event was a great time… for those 99.9% of you readers that didn’t make it, you aren’t gonna wanna miss next year. All of this year’s exhibitors will be back with way more fun and mayhem already in the works. just ot my sweet ride just in time for the cascade cream puff 100! At the Big Wheeled Ballyhoo I was able to test ride a Fox F-29 fork for the first time. Since it has an offset mated to work with the Paragon’s geometry that it was mounted to, I’ll reserve comment on certain aspects of the handling. look for a report on the Paragon to follow which will include these points. For this post, I want to focus in on the forks attributes that are not specifiaclly tied to the Paragon’s G2 geometry. Let’s take a short look here. First you have the all white finish. I’m not against white for a fork; however, I’m not really sure I like the white crown yet. It’s perhaps something that will grow on me, or it looks 80’s cheesy, like painted stems. I’m not sure how that’s going to go for me yet. I think a nice clear annodized crown may have been a better choice here. Regardless of the crown, the rest of the fork looks very beefy and well done. The typical annodized aluminum knobs adorn the top of the right fork leg and the graphics are not too obtrusive. Leaving the looks department, we get into the set up for this shock. I will say it was amazingly intuitive to figure it out. The demo mechanic did not have a proper manual, and did not know how to set up this 29″er fork for sure. (It might have proven easier if Fox would put a sticker on that showed a set up table like Rock Shox does) That said, the shock proved easy to figure out, and we played with the air spring just a bit before settling on a pressure of 85psi for my 240lbs weight. The lock out knob was easy to activate and seemed to work seamlessly. The rebound knob was easy to tweak with bare hands, but it might prove to be a fussier adjustment if you are wearing full finger gloves since the knob is a low profile affair. Now it was time to ride. 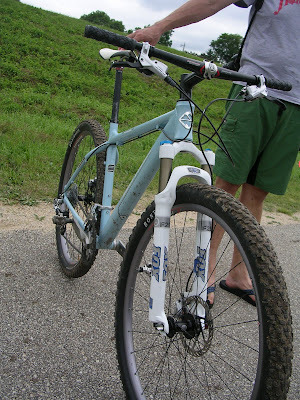 I usually ride a Reba SL fork when I use suspension up front, so that is my benchmark. I think the Fox is very close in feel when it comes to compression. Perhaps the Fox is a bit stiffer and not quite as “buttery” as a Reba, but again, I didn’t have a clue if I could change that by an adjustment. I liked the slightly stiffer feel anyway, so I’d probably leave it alone. The lock out worked as advertised, but I didn’t use it much at all. Out of the saddle grunts didn’t seem to cause too much bobbing, so I ran with it as it was. Off camber trails highlighted the stiffness of this chassis. I can say it felt rock solid in that respect with no hint of flex in my mind. I felt very confident in this forks ability to track online, so I didn’t hesitate to attack roots and rocks strewn across my path. I think it was a bit less forgiving on the smallest trail chatter than a Reba, but again, that perhaps could be adjusted for if I’d have had the knowledge to do so. Big hits were sucked up right off. Once in awhile I would hear a distinct hiss when the hit was more violent. I suppose the internal valving was working overtime right about then! Nothing seemed to upset this fork though, and I am impressed with my initial ride on it. All in all a welcomed arrival on the 29″er scene. I remember just a few years ago when most of us 29″er freaks thought we’d never see the day when Fox would have “29” emblazoned on a model of theirs. Well, that day has come, and I say it’s a good thing! Twenty Nine Inches has put the first Big Wheeled Ballyhoo in the history books and what a great time! We would be remiss if we first didn’t say thanks to all of our sponsors, and supporters, without whom we couldn’t have possibly done this. Thanks to Gary Fisher Bikes, Salsa Cycles, Raleigh U.S.A., Bike29, Cliff Bar, Rock Shox, and Chrome. Finally, thanks has to go out to all the hard work and backing from the City of Decorah, Iowa, Decorah Parks and Recreation, Jeff O’Gara, Rich Gosen, and all the wonderful trail workers and other volunteers in that great city. Now on to the report: Although the weather was a bit soggy leading up to the event, the skies co-operated with us and we had partly cloudy skies both days which was perfect from the standpoint of keeping the temperatures comfortable for riding. The trails were a bit greasy in spots during the first day, but firmed up quite nicely by the end of the Ballyhoo. We had a fair turnout for a first year event. Not exactly what we had desired to see, but vendors were reporting that the bikes were being demoed on an “average” basis in relationship to other events and several of the vendors reported that serious customers wanting to buy bikes were there test riding and making decisions. Folks we spoke with had a great time, praising the trails and the set up as being really fun and easy to access. We were literally a few blocks from downtown Decorah and the trail head. Sort of smack dab inbetween, if you will. The raffle was a blast! The highlight being that the Raliegh XXIX+G was won by a fellow with an old 26″er on his birthday! He was thrilled to say the least. Lots of swag was handed out as well, so just about everybody was able to take something home from the Ballyhoo. We have a couple of product highlights that we gleaned from the demo area of the Big Wheeled Ballyhoo that we will be talking about in the next few days. The new Fox fork was ridden, the new Gary Fisher Paragon was thrashed, and we have news on some upcoming WTB tires to share with you all. Stay tuned! For the record, we will be doing another Big Wheeled Ballyhoo next year, so stay tuned for that. Thanks again to all who either supported or participated in this first Ballyhoo. You are currently browsing the The Big Wheeled Ballyhoo blog archives for June, 2007.